President Trump has not been seen frequenting church services since his assuming office, but his outward rhetoric on God has changed as of late. The president and first lady Melania Trump attended Easter service at Bethesda-by-the-Sea Church in Florida on Sunday, making it the fourth official religious appearance for the commander in chief. As people close to the president and outsiders looking in conjecture as to how Trump's religious views have changed, one man recalls a moment in which he asked Trump whether he believed in God. "Donald has never been a spiritually or religiously serious person," Timothy O'Brien, author of the Trump biography "TrumpNation: The Art of Being Donald" tells POLITICO. That statement, though, is in slight contrast to how Trump answered O'Brien's asking the president whether he believed in God in the mid-2000s. "Yes. There has to be a reason we are here. What are we doing? You know there is an expression: 'Life is what you do while you're waiting to die,'" Trump responded, as O'Brien's book states. "There has to be a reason that we're going through this. There has to be a reason for everything. I do believe in God. I think there just has to be something that's far greater than us." President Trump has invoked God's use in public rhetoric with relative frequency since his January inauguration. In context to the U.S. airstrikes in Syria, a newly appointed Supreme Court justice and a war on the opioid epidemic -- the president has enlisted a higher power in discussing each of these topics. In one of the first interviews of his presidency, Trump sat with the Christian Broadcasting Network and talked about his thoughts on prayer. 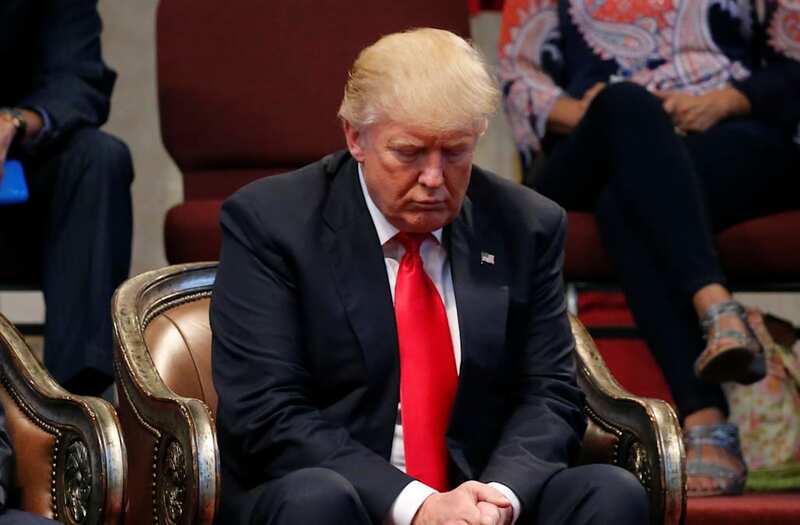 "I've always felt the need to pray," Trump stated. "The office is so powerful that you need God even more because your decisions are no longer, 'Gee I'm going to build a building in New York.' ... These are questions of massive, life-and-death." After celebrating the Christian holiday on Sunday in Florida, President Trump and Melania Trump will host their first Easter Egg Roll at the White House on Monday. Pope Francis waves at the end of his "Urbi et Orbi" (to the city and the world) message from the balcony overlooking St. Peter's Square at the Vatican April 16, 2017. Girls curtsey as Britain's Queen Elizabeth and prince Philip leave the Easter Sunday service in Windsor Castle, in Windsor, April 16, 2017. Britain's Prince William and Catherine, the Duchess of Cambridge, arrive at the Easter Sunday service in Windsor Castle, in Windsor, Britain, April 16, 2017. U.S. President Donald Trump and his son Barron board Air Force One at Palm Beach International Airport in West Palm Beach, Florida, U.S. after Easter weekend, April 16, 2017. Members of the clergy gather outside The Episcopal Church of Bethesda-by-the-Sea in Palm Beach, Florida, as President Donald Trump and First Lady Melania Trump attend Easter Sunday service, April 16, 2017. Christian worshippers light candles during a Sunday Easter mass procession in the Church of the Holy Sepulchre in Jerusalem's Old City April 16, 2017. An Ethiopian Orthodox priest blesses the faithful during easter eve prayers at the Medhane Alem church in Addis Ababa, Ethiopia, April 15, 2017. Picture taken April 15, 2017. Sorbian men dressed in black tailcoats ride decorated horses during an Easter rider procession near Crostwitz, Germany April 16, 2017. A dog sits in a carriage during the annual Easter Parade and Bonnet Festival along 5th avenue in New York, U.S. April 16, 2017. People carry a statue as they participate in an Easter Sunday procession through the streets of Tegucigalpa, Honduras April 16, 2017. Lebanese Christian priests distribute painted eggs to celebrate Greek Orthodox Easter after an Easter service at St. George church in central Beirut, Lebanon April 16, 2017. A priest blesses Ukrainian servicemen to mark Orthodox Easter at their position on the front line in Luhansk region, Ukraine, April 16, 2017. Chileans take part in a symbolic burning of an effigy representing US president Donald Trump as part of Holy Week celebrations in a neighborhood of Vina del Mar, Chile April 16, 2017. A priest leads the Easter Mass in Mar Gewargis (St George) Chaldean Catholic church, which was damaged by Islamic State militants, in the town of Tel Esqof, Iraq, April 16, 2017. Christian worshippers surround the Edicule as they take part in a Sunday Easter mass procession in the Church of the Holy Sepulchre in Jerusalem's Old City April 16, 2017. Nuns attend the Easter mass led by Pope Francis in Saint Peter's Square at the Vatican April 16, 2017. Catholics take part in the Procession of Lights, as part of the Holy Week celebration in Nahuizalco, El Salvador April 15, 2017. How did Trump spend Easter?